Cpl. 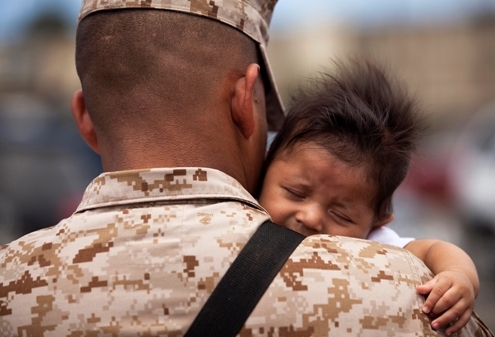 Antonio Tellez, an administrative clerk with Headquarters Battery, 1st Battalion, 12th Marine Regiment, holds his 3-month-old son before departing Marine Corps Base Hawaii on a seven-month deployment to Afghanistan in support of Operation Enduring Freedom, April 25, 2011. Over the course of the week, approximately 550 Marine and sailors from 1/12 departed Hawaii to replace 1st Battalion, 10th Marine Regiment, in Afghanistanâs Helmand province. Unlike their last two deployments â supporting Task Forces Military Police in Iraq â 1/12 will revert back to its primary mission and provide artillery fire support to 2nd Marine Division (Forward) during ongoing counterinsurgency operations in the province.